Proposal Submission Deadline: Friday, January 25, 2019, 11:59 p.m.
It’s time for change. To begin anew. A fresh start. Motivated by the siren song of new technology or by the desire to reach out to new audiences, Connecticut history organizations are reinventing themselves in meaningful and exciting ways. Visitors are part of this change – they crave more interactive experiences from historic institutions, from escape room antics to hands-on learning. Has your organization started something over in a new and interesting way--rebooted​​ your exhibition schedule or annual fund-raising event? Have you given new form and structure to roles within your organization, or changed the appearance of your website, logo, labels--or ​revamped​​ a volunteer recruiting and training program? Have you dusted off a traditional approach and imbued it with new life and vitality--​revitalized​​ your school program in response to new research or curriculum frameworks? How did visitor evaluations, surveys, and anecdotal observations impact your thinking? If you ​​have​​ taken a fresh look at perceived best practices and started tinkering with new or out-of-the-box ideas, we want to hear from you!​​ Inspire others to take the risks you museum pioneers have taken by sharing success stories as well as lessons learned the hard way. 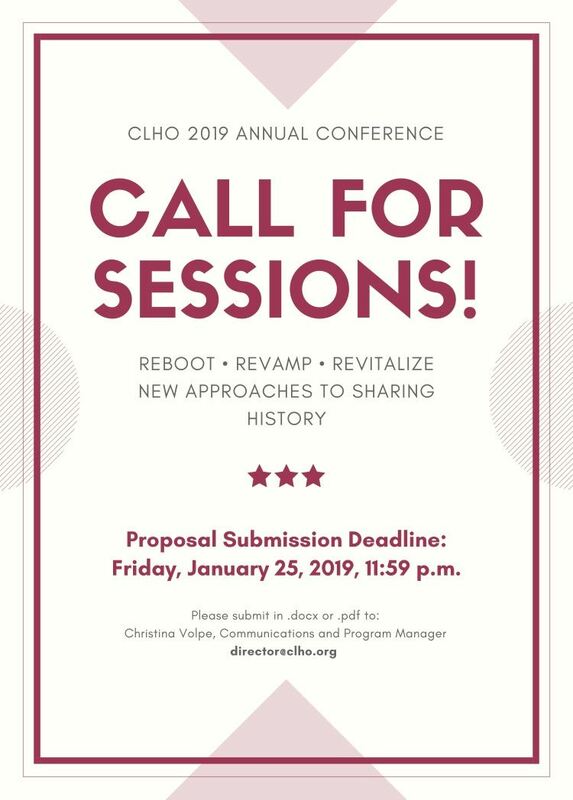 The Connecticut League of History Organizations invites you to share your insights at the next ​CLHO Annual Conference on June 3, 2019​​. This full-day conference is the perfect opportunity to hear practical advice, learn new skills, and participate in active discussions with colleagues, as well as network with friends old and new. Let’s prove that history organizations statewide can celebrate the past in new and interesting ways. You can contribute to this conversation by proposing a session for the conference. Sessions can be panel presentations, roundtable discussion, hands-on demonstrations, or experiential (role-play or performances), etc. In the spirit of rebooting, try something new. We are also looking for a range of sessions geared to our diverse audience: from volunteers to volunteer coordinators, curators, educators, and others, whether students just getting into the field or seasoned professionals. Please note, in the spirit of rebooting and trying new things, the CLHO Annual Business Meeting and CLHO Awards of Merit Ceremony which are normally held concurrently with the Annual Conference, will become their own separate event in April. This will allow us to focus on honoring Awards recipients and showcasing their projects as well as making it possible for the Annual Conference to offer more sessions and learning opportunities.